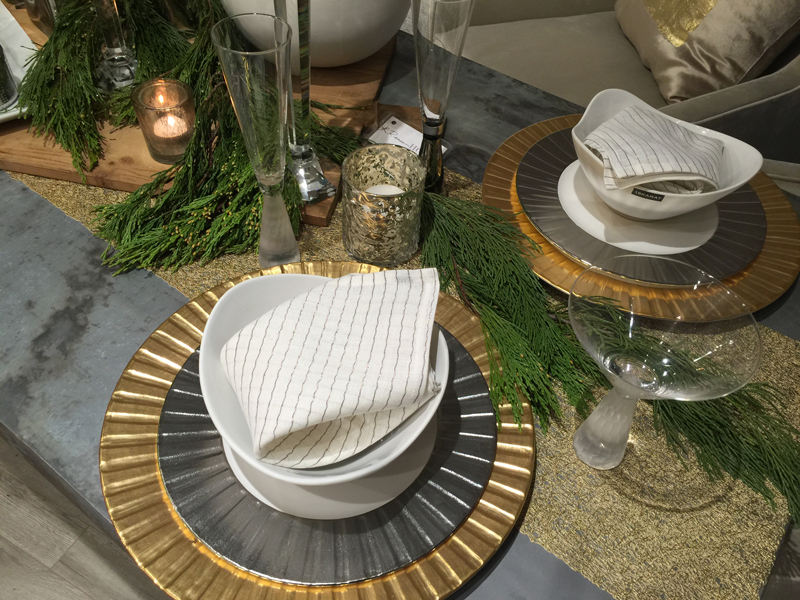 Last week, Rachel shared her best holiday entertaining secrets and invited some of our customers to attend our "Tablescapes For The Holidays" event last Thursday evening. As we bring our loved ones together for Thanksgiving, how we dress our table can be a fun part of embracing the day and setting a wonderful mood of joy and inspiration. So today, I am going to share pictures of all the beautiful tables that our team prepared for our guests last Thursday along with a few of our favorite tips! 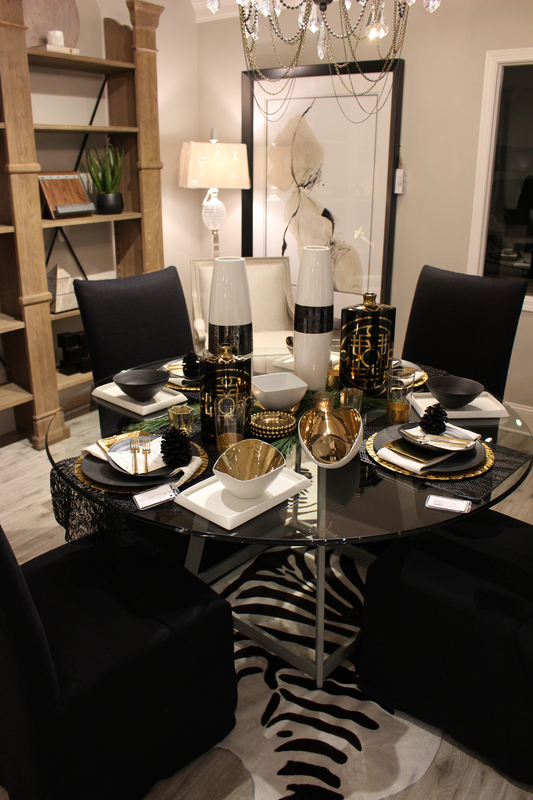 The first table that was set was this beautiful black, white and gold table. What better way to modernize your Thanksgiving table than with a non-traditional color palette that feels both simple and grand. 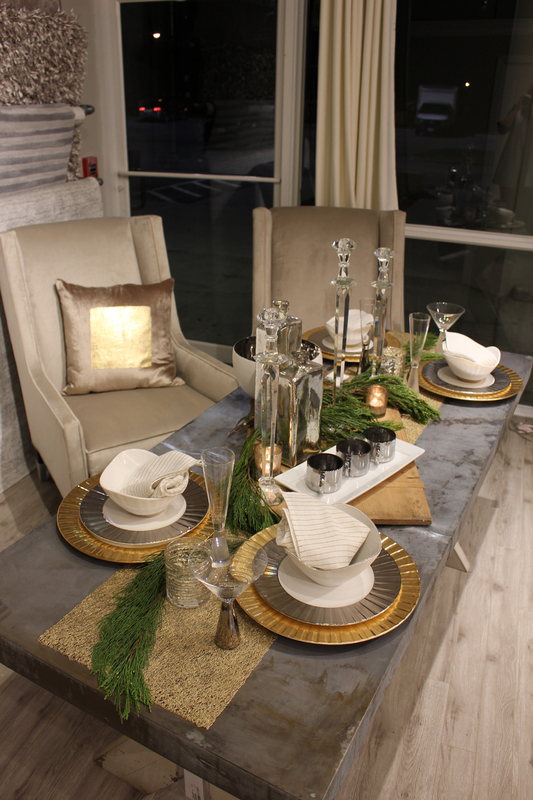 Whether you are setting a table, furnishing a room or even creating a memorable outfit... the secret is in the layers. If you were just to put a sofa, two chairs, and a cocktail table in your living room with nothing else, it might feel a little boring or unfinished. The same applies for a table setting. Keep in mind that your table is more about an inspired presentation than the functionality. You can always strip some of the layers away when you sit down to eat! 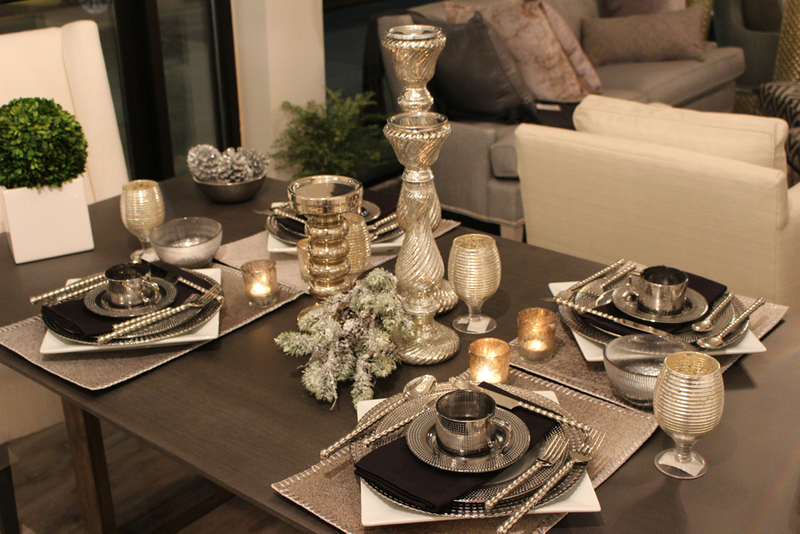 Tip: An eclectic mix of dinnerware will add the perfect charm and whimsy to your holiday table spread. A nice touch for your table is to print your menu and add to the mix. It took about 15 minutes to type our sample menu and print it out on some of our favorite stationary. Tip: Big centerpieces might feel too stuffy and get in the way. Keep the height of your tallest item to about 14 inches so your guests can easily converse across the table. The next table our team pulled together shows you how simple it is to mix your everyday white dinnerware with your better china. 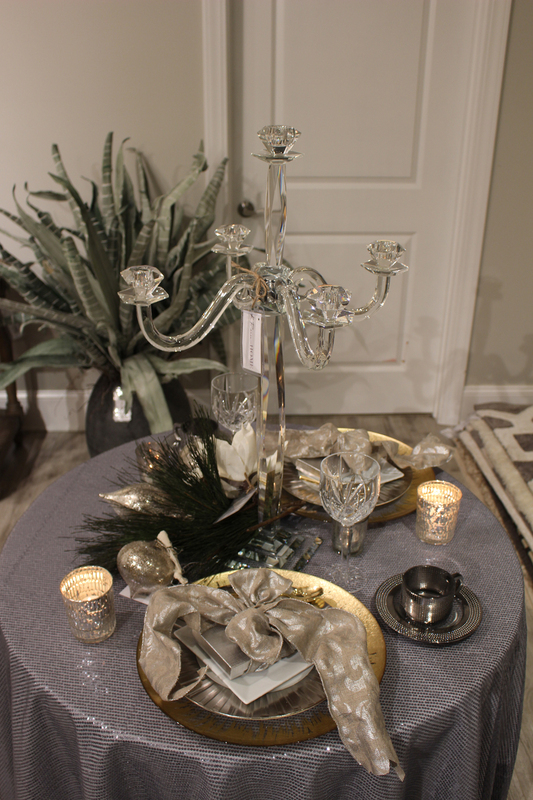 Tip: Use candles (lots of them) and pair with metallic accents. Nothing says holiday more than mercury. Try artfully displaying your beautiful flatware. Our favorite thing about this table? Definitely these cowhide mats with a silver whipstitch trim. 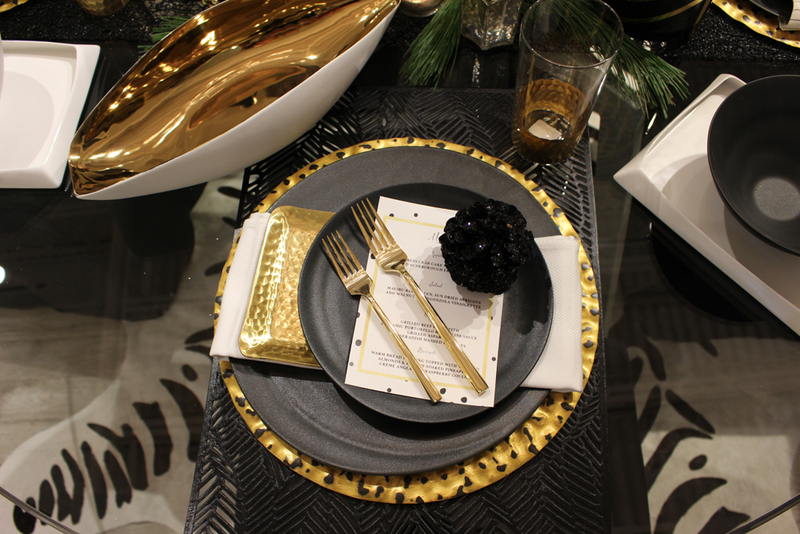 These beautiful placemats add an unexpected texture to this elegant holiday table. Also notice how we love to position placemats vertical rather than horizontal for a sleeker look. There is no need to stop at your dining table; you can also create all types of beautiful vignettes for every horizontal surface in your home. 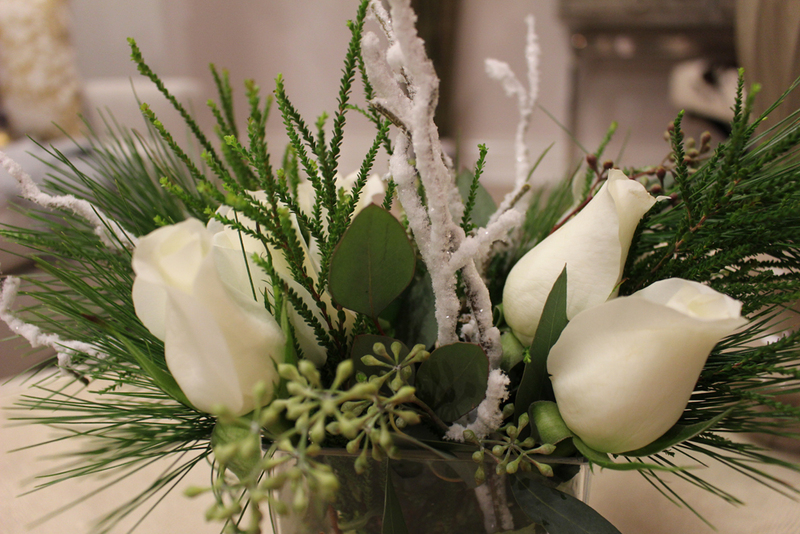 Here, we simply added some greens of the season, some pretty ribbon, and a few white florals. Simply elegant. Tip: Compliment your space, don’t compete with it. 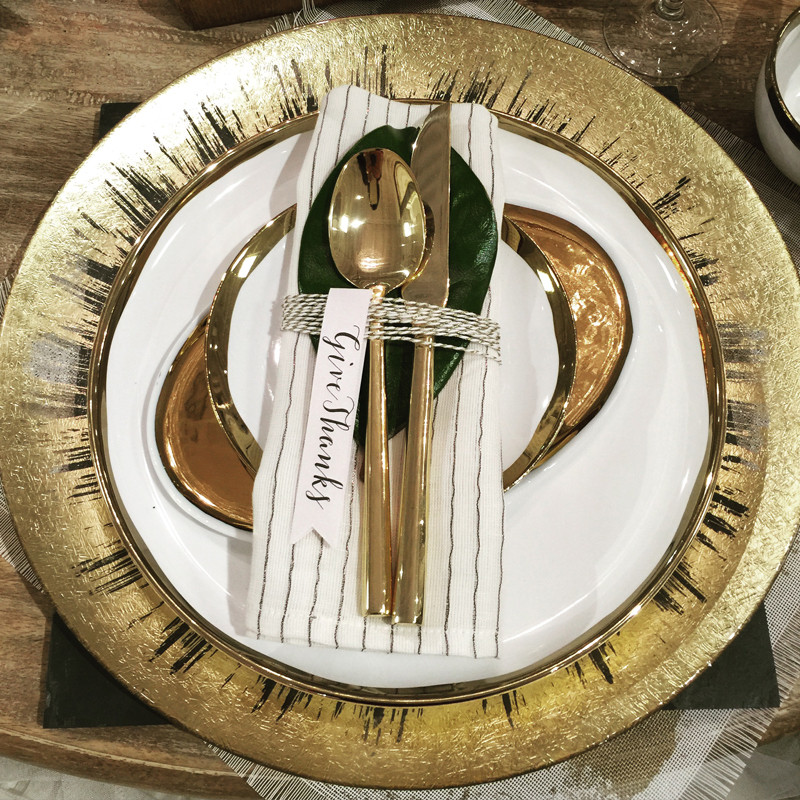 Utilize items in your tablescape that compliment the colors and décor already in your home… that way the décor will fit naturally and beautifully. If there were just one thing you could do for your holiday event, I would recommend doing some simple floral and seasonal foliage arrangments. 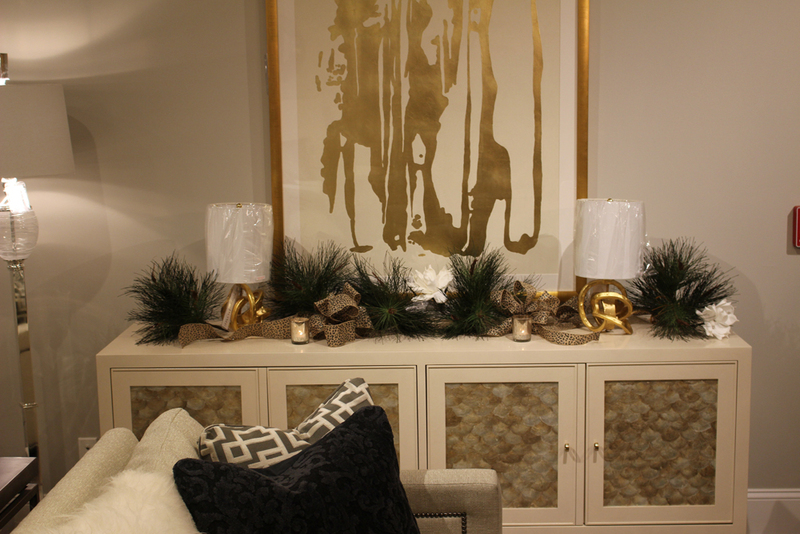 It is one of the easiest ways to style and decorate for the holidays. 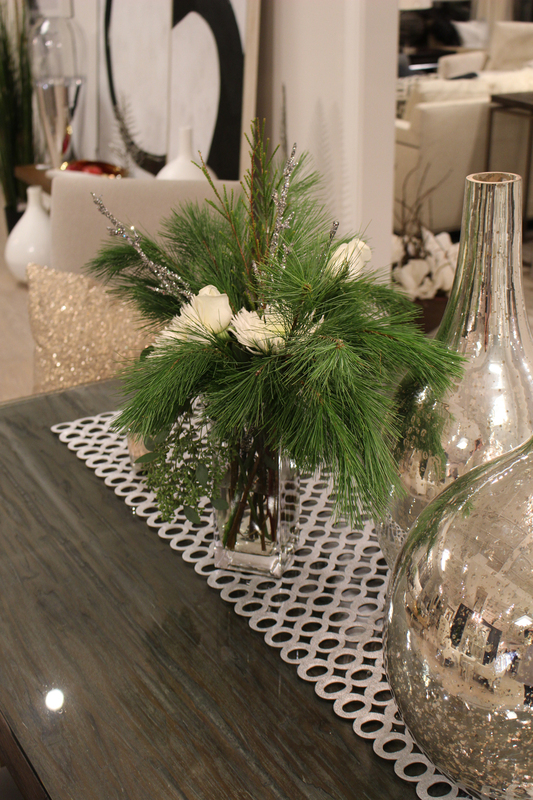 Bring the outside in by using fresh greens and natural elements that can only be found this time of year! How beautiful are these? Tip: Use fresh flowers of the same color and natural elements of the season to create effortless and stunning arrangements. Our third table gives us a rustic, comfortable yet elegant feel. Candlesticks, votives and fresh greens drape the center of the table over a textural gold lace runner. 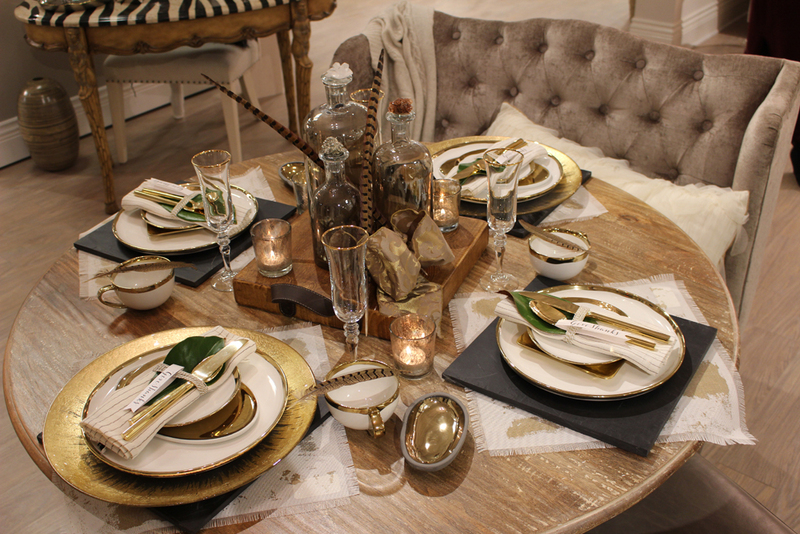 You can make even the most rustic table look and feel like a million bucks. Tip: Sometimes keeping it simple – “less is more” - and using natural elements with pops of gold and silver can be the perfect complement to winter casual and natural design. 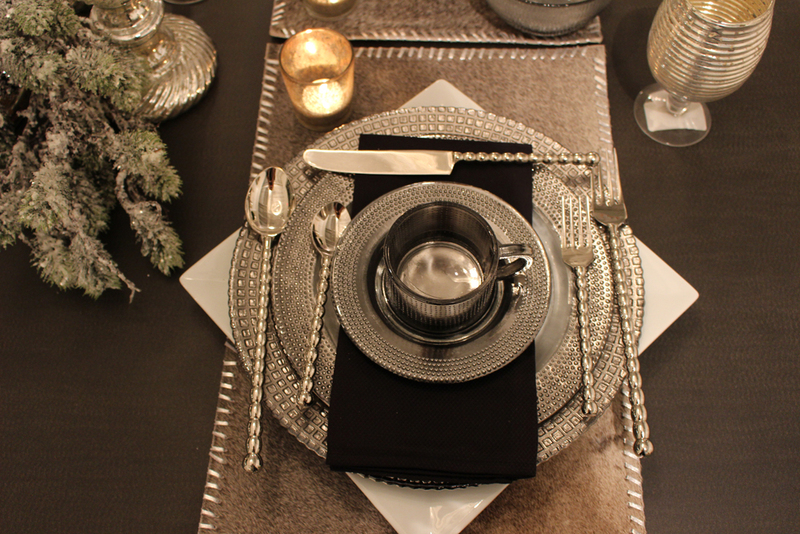 Tip: Place settings are not only a time to get creative but also a time to get personal. When you add something meaningful to your table, it creates an intimate atmosphere that welcomes your guests and allows them to feel closer to your family. This little table was my personal favorite. I love whimsy of the pheasant feathers. The center arrangement sits on a wood block and is composed of glass bottles (we all have them somewhere in our homes), a few well-placed feathers, votives, and ribbon. How simple? How beautiful? Tip: Use organic items… feathers, branches, fruits, herbs, pinecones. They can easily be added to your tabletop. A little sprig of rosemary and a few cranberries can carry a theme from start to finish! A napkin doesn't always need to be folded in an unusual way to make a statement. A memorable place card is created by bundling a napkin, flatware with greenery (we used a magnolia leaf) from your garden and then tieing them together with ribbon, twine or a leather chord. The next table we created was simply a small round card table. It seems like we always have more people than my tables can handle at my house during the holidays, so I always end up throwing together a few extra tables. I think that if you can't sit at the big table... you ought to have your own unique little beautiful oasis. We simply gave this little table a big look by adding a substantial candelabra, a few fresh greens and the same settings as its companion table. Tip: You can make napkins, runners or a tablecloth from beautiful fabric from a fabric store. A unique fabric can totally transform a table and bring new life to your tried and true place settings. I hope that we provided you with a little inspiration for your own holiday entertaining. The most important thing to remember is that there is no perfect table setting. The simple act of making the effort is what will make your table perfectly beautiful. Please take a moment to think about the deserving people in your life and make a nomination. 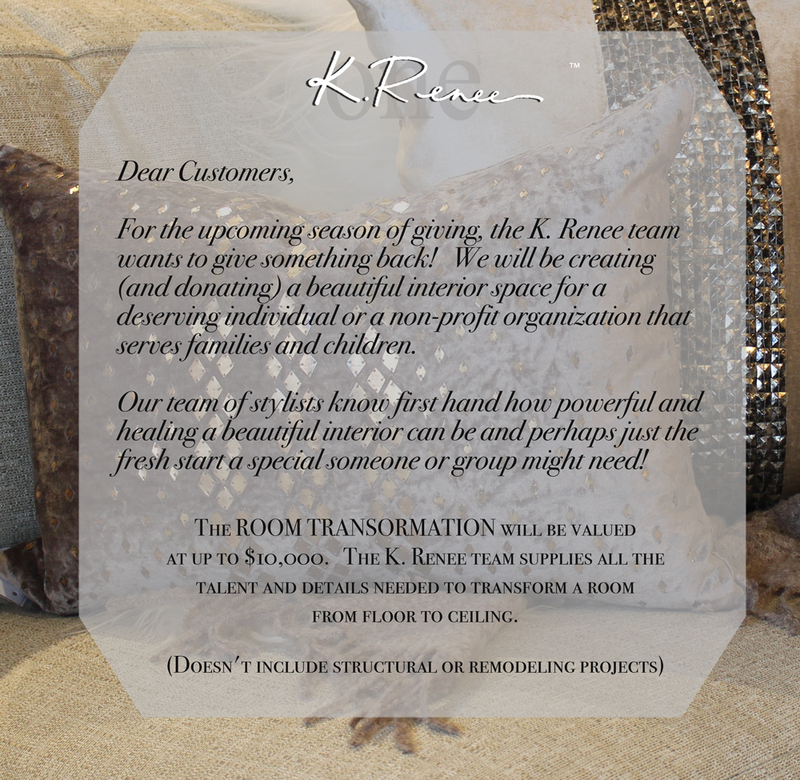 Please email to us (info@krenee.com) a 200-500-word essay about a special person or non-profit organization that you believe could use a helping hand in their transformation journey. Nominations will be taken through Saturday, November 28, 2015. The selection committee will be composed of a few of our long-standing K. Renee customers. 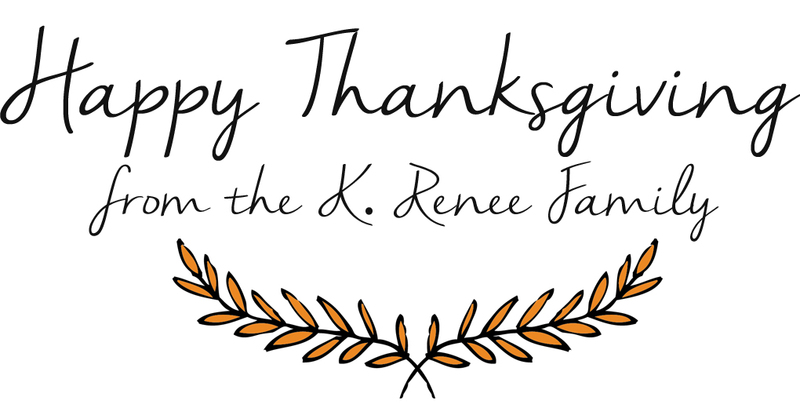 As we count our blessings at K. Renee, just know how grateful we are for each and every one of you!